Time to tell you about a new variety that we are giving away this year. 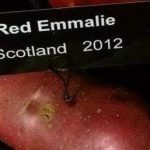 Red Emmalie is an early maincrop oval tuber, with red skin and red flesh. It is ideal for mashing and boiling and will retain its colour, making a great new addition and fun for the family meal! 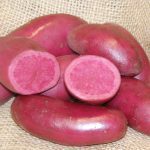 We will be publishing details of where you can get your seed potatoes at the weekend. We will be at various events throughout Aberdeen City & Shire and they are all free to enter, just come along and collect free seed potatoes!